A substantial proportion of patients with advanced thyroid carcinoma fail to respond to or at some point become refractory to conventional therapies. This resistance and the phenomena of thyroid cancer progression and metastasis themselves are thought to be related to tumor-cell sub-populations with stem-like properties. We isolated thyrospheres from four advanced thyroid carcinomas that were resistant to radioiodine therapy and analyzed their molecular profiles. ALDH activity and proteomic profile of main stem cell markers were used to assess stem cell properties. The TaqMan Low Density Array approach was used to evaluate the expression of several genes involved in the EMT process. The phosphorylation status of tyrosine kinase receptors (RTKs) was analyzed to identify potential markers for targeted therapies. We then investigated the effects of the EMT-inhibitor crizotinib on both cell proliferation and phosphorylation status of RTK targets. The cancer stem-like properties of a subset of cells from primary cultures of each tumor were demonstrated. 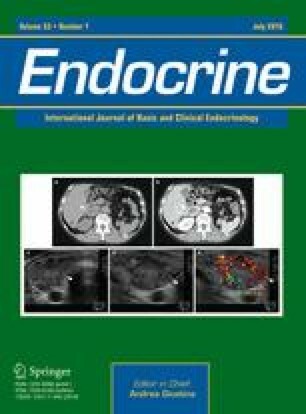 A wide variability among thyrospheres arising from the four thyroid cancers in terms of ALDH activity, stem cell marker expression, and phosphoproteome profiling was present. Dysregulated expression of genes involved in the EMT was observed in all four thyrosphere lines. Treatment with crizotinib was ineffective in cancer stem-like cells, suggesting the presence of a mechanism of resistance in thyrospheres. Collectively, our data indicate that thyroid cancer stem-like populations vary markedly from tumor to tumor and require detailed molecular and biological characterization if they are to be used as the basis of “personalized” treatment of aggressive disease. Mariavittoria Dima and Valeria Pecce have contributed equally to this work. The online version of this article (doi: 10.1007/s12020-015-0739-y) contains supplementary material, which is available to authorized users. This study was funded by grants from the Italian Ministry of Universities and Research (FIRB 2008—number RBFR082XL7_003 to C.D., MIUR/Cofin 2010-2011 to D.R.) and from the Fondazione Umberto Di Mario ONLUS. The manuscript was edited by Marian Everett Kent, BSN.